A family run company providing homecare services to the people of Wigan. They provide quality care to help people retain their independence and improve their general wellbeing. 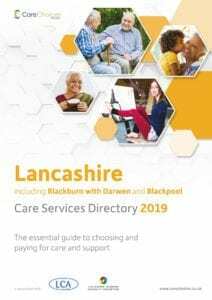 The Independent Lancashire care directory has been produced by Care Choices to provide people with a guide to social care services in Lancashire. The care information explores topics such as funding care, getting a council assessment, personal alarms and care homes. Call Care Choices on 01223 207770 to get your free copy of the Lancashire Care Services Directory.